Rise and shine to the stunning peaks and lakes of the Canadian Rocky Mountains! Everywhere there are sky-high alpine meadows filled with wildflowers. Amazing wildlife at every turn. Here is a Canadian female black bear (Ursidae) with its cub looking for something to eat! Begin your active, multisport adventure exploring the backcountry of Kananaskis Country, Alberta, Canada. Saddle up at Boundary Ranch for a horseback riding trail ride through Canadian forests. Or bicycle on the gorgeous Rocky Mountain Legacy Trail, a paved 25km trail that goes from Canmore to Banff and follows the scenic Bow River Valley. ...and keep your eyes open for resident wildlife during our ride, like this male elk with velvet still on his horns. After finishing one of these two options, you'll get together and hike to a magical waterfall, rimmed with cliffs and ferns. One morning you have an encounter of the canine kind! Visiting a local dog-sledding base camp, you get to play with some of the puppies that live here. You'll meet the dogs and their trainers while you learn about what it takes to raise and train sled dogs, dogsledding commands and team dynamics. Tonight you'll stay in a cozy chalet or log cabins in the spectacular setting of Banff National Park. Relax in the sauna, or hike to a nearby waterfall if you have more energy! The Icefields Parkway is considered one of the world's most spectacular roads, with inspiring vistas at every bend. ...and moose taking a drink from a reflection lake. You can stop to take pictures along the way! 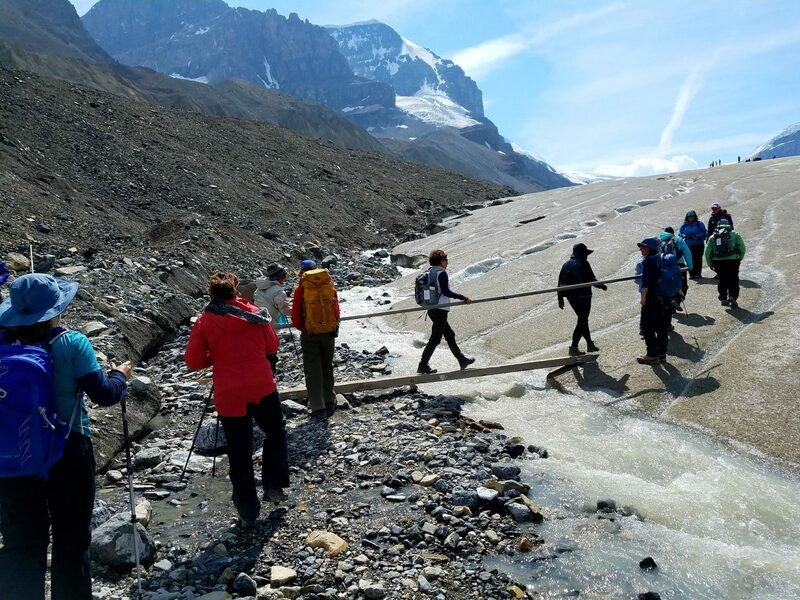 An exciting ice-walking adventure with an expert guide on the Athabasca Glacier teaches you all about how climate change is impacting our planet. The Icefield stretches for more than 15 miles across the Continental Divide, and the walk takes you to a world few people ever see or experience firsthand. After lunch, we might even get a little "carried away" with our ice axes! There's one activity that adventurous women ALWAYS love, and you can't miss that! Your whitewater raft trip takes us to the Kicking Horse River, renowned as the best of Canadian Rockies whitewater rafting. Go AdventureWomen!! After your raft trip and more exploration in Yoho National Park, head to the historic and picturesque town of Banff, in Banff National Park, to enjoy some "retail" time and fun in the "city." Your stylish home offers a spa, and is the perfect base for exploration of the region's fabled mountains, lakes and trails. Your last day offers two hiking options, the 6 mile, 1,700 foot elevation gain Larch Valley hike, or the Sentinel Pass hike, which traverses 7 miles with a 2,375 foot elevation gain. Hike up to a high alpine meadow covered in seasonal wildflowers. Who knew Canada could be so beautiful? Savor the moments of your last hike as you ascend with new friends, made on the trail. Sapphire skies and towering peaks offer awe-inspiring panoramas all along your way. ...where 360-degree panoramas make for impressive "we were here" posts! Returning to the lodge, gather together for a Farewell Dinner, to celebrate the end to this active week of fun in the spectacular Canadian Rocky Mountains! From vast glaciers to towering mountains, this seven-day active, Canadian adventure including hiking, biking, horseback riding, spelunking, and rafting in Canada’s Rockies in August 2019 is sure to take your breath away! The vast untamed expanses of Canada’s Kananaskis Country, lying just west of Calgary, Alberta, spans diverse ecosystems filled with wildlife including black and brown bear, moose, and big horn sheep. Kick off your Canadian Rockies active adventure with either a horseback trail ride or an mellow bike ride on a stunning path through the mountains. Crisp scents of mountain forests and stunning views in every direction make each a feast for the senses. A beautiful waterfall hike along the cliffs offers incredible vistas. Unwind and soothe your tired muscles in our outdoor hot tub in the evening as you swap stories and get to know the other adventurous women sharing your journey. You’ll get to choose to spend the next day either winding through (by bike), or burrowing beneath (caving), the imposing mountains of the Canadian Rockies. A long, gentle bike ride over the hills will get your heart pumping. Alternatively, spelunking in the Rat’s Nest Caves offers a chance to explore magnificent geological formations. Exploring The Grotto, a cave filled with stalactites and stalagmites with a crystal clear pool at the bottom, is an unforgettable experience deep within the Rockies’ core. Unwind with a short hike with your new AdventureWomen friends, or relax and share your experiences in a traditional sauna. The glittering expanses of the Columbia Icefields will dazzle you. Pick your way across the surface of a glacier, a unique and starkly beautiful world unto itself. Marvel at turquoise-blue glacial lakes, reflecting startlingly clear images of the snow-capped mountains towering overhead. Whitewater rafting at the Kicking Horse River will be a high-adrenaline experience that brings the whole group together! Your rafting guide will lead you through 14 sets of rapids, including “Roller Coaster” and “Shotgun.” Then visit the (much calmer) Lake Louise, famous for its milky blue waters. Cap off your Canadian Rockies journey with one of two spectacular hikes through pristine forests up to the sparkling Minnestimma Lakes. An optional hike to the summit of Sentinel Pass offers truly breathtaking views of the verdant valley below. This unspoiled land in Canada’s heartland in August 2019 is the perfect setting for new friends, new adventures, and unforgettable memories! Need more incentive? Read our guest reviews from our 2017 Canadian Rockies trip with AdventureWomen! And here’s what fun they had rafting! Meet at 3:00pm at the Calgary International Airport for your group transfer to the beautiful Kananaskis Valley and the Coast Canmore Hotel, your accommodations for the next two nights. After settling in to your room, enjoy a delicious Welcome Dinner before introductions and orientation to hear from your guides about the exciting upcoming adventures for the week. First option: A classic horseback trail ride from the legendary Boundary Ranch is the perfect way to discover the adventure and serenity of a Canadian tradition on a guided horseback trip. Pristine views, flowered alpine meadows, and abundant wildlife are just a few of the scenic wonders you’ll experience. Ride the ancient trails of the Nakoda people, through pine scented montane forests with beautiful mountain views. Abundant wildflowers and diverse wildlife call these mountains home, so don’t forget your camera! Second Option: Go on a beautiful bike ride on a stunning path through the mountains. This is a relatively mellow ride. While long, there are not major ascents or descents. Lunch will be served along the way. Take a magical hike to a beautiful waterfall rimmed with cliffs and ferns. Head back into Kananaskis Village to explore or take a relaxing soak in an indoor or outdoor hot tub. Enjoy dinner at the hotel this evening. First option: Go on a spelunking expedition to Rat’s Nest Caves to explore an amazing network of underground caverns. With no lights, no handrails, and no walkways here, you’ll get to experience it like the explorers who first discovered it—by lantern light! Thousands of years in the making, a spectacular subterranean world is waiting for your discovery. Your expert guide will introduce you to the fascinating world of caves as you explore the ancient cave formations. Learn about local mountain geology, how the caves were formed, examine fossils up close, and learn the story of prehistoric bones found in the first chamber. Your explorations will take you through ‘the Box’, then on to the Five Way Chamber, the Grand Gallery, and finally the Grotto – a chamber full of stalactites and stalagmites with a crystal clear pool at the bottom of the cave. You will need to crab-walk, fit through small spaces, and have decent upper body strength for this excursion. Second option: Ride a mountain bike on an easy 25K gorgeous loop trail. Completed in celebration of the 125th anniversary of Banff National Park, the Rocky Mountain Legacy Trail is a paved bike trail connecting the mountain towns of Canmore and Banff. This ribbon of adventure follows the scenic Bow River Valley, with stunning mountain views of the Three Sisters peaks, Mount Rundle, and the sparkling Vermilion Lakes. Enjoy lunch along the way. The day ends at a cozy chalet, where you can relax in the sauna. Travel to the dazzling Columbia Icefields, which drapes across the North American Continental Divide and covers 125 square miles. An exciting ice-walking adventure with an expert guide on the Athabasca Glacier offers the chance to peer into mini ice canyons and crevasses while learning the secrets of eons-old glacial formation. Welcome to a world where snow and ice, rock, and sky dominate the land. The Columbia Icefield is the largest mass of ice in the Rocky Mountains – stretching more than 25 kilometers across the Continental Divide. From its melting snows and many glaciers, waters flow across North America to the Atlantic, the Arctic, and the Pacific oceans. Your Ice-walk adventure is on the Athabasca Glacier, a 3.5 mile tongue of ice that flows from the icefield, giving us access to this stark alpine world. It is a world few people ever see, let alone experience firsthand. Enjoy lunch on the glacier. On the drive back, take in the awesome views of glacier-formed Peyto Lake and the reflections of mountains in beautiful Bow Lake. Arrive back at the resort in time to refresh before dinner. Head to the Kicking Horse River for whitewater rafting! The Kicking Horse River is renowned as the best of Canadian Rockies whitewater rafting and the Middle Canyon offers an exceptional stretch of whitewater that is just right for first time adventurers and more seasoned paddlers too. Once you are fitted with a government-approved life jacket, helmet, wetsuit, booties, gloves, and spray jacket (all CLEAN and DRY!) your guide will go over safety procedures and paddling techniques you will use on the river. There are over 14 sets of named rapids – such as, “Roller Coaster,” “Hopi Hole,” “Goat,” “Twin Peaks,” “Portage,” and “Shotgun” that are sure to leave you with big smiles. You will not soon forget this excellent river adventure. Go AdventureWomen! On the way to Banff, stop at Lake Louise, whose legendary milky blue color is created by finely sifted glacial rock. Enjoy time to explore the picturesque and historic resort town of Banff, your home base for the next two nights. If you wish, take an optional soak in the world-famous hot springs pools (at your own expense). Dinner is on your own tonight in one of Banff’s many restaurants. You can choose from either the 6 mile, 1,700 foot elevation gain Larch Valley hike, or the Sentinel Pass hike, which traverses 7 miles with a 2,375 foot elevation gain. Both hikes start in the dreamy Valley of the Ten Peaks at Moraine Lake and lead through a peaceful larch forest and up to a high alpine meadow where carpets of alpine wildflowers fill the meadows. Continue to the sparkling waters of Minnestimma Lakes, which reflect the sapphire skies and towering peaks of the ten attendant mountains, an awe-inspiring panorama. After a picnic lunch, those who are up for it can continue to the summit of majestic Sentinel Pass, where 360-degree panoramas make for impressive “we were here” posts! The views are spectacular. Paradise Valley and the breathtaking peaks of the Continental Divide unfold to the north, while the glaciated spires of the Ten Peaks fill the horizon to the south. This is one of those mountain destinations that almost defies description. Gather for a delicious Farewell Dinner to celebrate the end of this fantastic and fun week in the Canadian Rockies! Say goodbye to your new AdventureWomen friends as you transfer to the airport for your flights home. Arrive: Arrive at Calgary International Airport (YYC) in Alberta, Canada on August 4, 2019. The group will meet at 3:00pm at the airport. Depart: Depart Calgary (YYC) on August 10, 2019 after noon. Arrive: Arrive at Calgary International Airport (YYC) in Alberta, Canada on August 11, 2019. The group will meet at 3:00pm at the airport. Depart: Depart Calgary (YYC) on August 17, 2019 after noon. Citizens of the United States must have a passport valid for six months beyond your travel dates with at least two blank facing pages. If you do not have a passport, please apply now! We rate this trip as High Energy. Our High Energy adventures are designed for women who enjoy a physical challenge and crave being on the go! You should be prepared for itineraries that include (but are not limited to): a full day of biking on rolling terrain, hiking 5-8 miles on moderate to steep trails, being active at high altitudes, whitewater rafting, or skiing. Make an appointment with a travel clinic. There are no immunization requirements for travel to India, however your local travel clinic may have recommendations for you based on your age, health, and past vaccination history. For more health information, go to www.cdc.gov/travel and navigate to the page about India. The currency of Canada is the Canadian Dollar. Credit cards are generally accepted and ATMs will be available. August 4 Departure Final Payment Date: on or before May 6, 2019. August 11 Departure Final Payment Date: on or before May 13, 2019. The Coast Canmore hotel is set in one of the most beautiful locations in all of Alberta. The mountains are always in sight and gorgeous and serene lakes and reservoirs are never far away. With comfortable and spacious rooms, the hotel has all the amenities to make our stay wonderful, from the pool, hot tub, and fitness center to the restaurant, lounge, and free WIFI. The only thing better than the rooms, the views, and the amenities is the friendly and attentive staff. With the cozy charm of a mountain log home and the spectacular setting of Banff National Park, the Baker Creek Mountain Resort is a delightful base for exploration. The individual chalets, furnished with hand-made wooden chairs and tables, each feature a fireplace/wood-burning stove and front porch—perfect for watching the local wildlife amble by. The casual Bistro offers up delicious meals for hearty appetites in a pioneer-times atmosphere. Baker Creek is the winner of the “Banff Heritage Tourism Award” for its authentic mountain lodging experience. Nestled in the center of the resort town of Banff, the Delta Banff is the perfect base of exploration for the region’s fabled mountains, lakes, and trails. The airy guest rooms are stylishly furnished with sanctuary beds and table and chairs; amenities include a mini fridge, flat-screen TV, coffee/tea-making facilities, bathrobes, and an ensuite bathroom with tub. The Evergreen Restaurant serves inviting meals made from locally sourced ingredients, and The Grotto Spa offers relaxing massages and wraps. Weather is always unpredictable in the mountains - dress accordingly. You will want outdoor clothing and gear to be safe and comfortable. Most days you will be comfortable in a t-shirt and shorts, however, even in August, you must be prepared for rain and maybe snow at higher elevations. Layering is key! What guests are saying "Canadian Rockies: The Ultimate Active Outdoor Adventure"
"Traveling with Adventure Women (AW) was one of the few times where the amazing trip I dreamed of in my head actually was the reality! I was lucky enough to go on the Canadian Rockies trip in 2017 and had an incredible time. This was my first time to ever "go on my own" so to speak but I wanted to travel and do trips like the ones AW offers but never had anyone to go with me. Then I found AW! From the moment I showed up at the airport and met my guides and my group, to the end when I boarded my plane to come home, everything was perfect! I made wonderful new friends and made memories that will last a lifetime. I have told everyone I know about AW and their trips. I already signed up for Peru in the fall of 2018 with them as well. Can't recommend this company enough! Travel with AW and the experiences I have are my gift to myself and help me to challenge myself and broaden my worldview." "Everything was taken care of for me, all I had to do was show up and be ready for adventure... now that's a vacation! The staff is incredibly helpful and the guides were outstanding. They were knowledgeable, fun, hardworking, and always had a pulse on how each guest was feeling. I like that they offered alternate hiking routes on the more challenging hiking days. The camaraderie in the group was off the charts! By the second day, I felt like I was traveling with my close friends. It was an experience I will always remember and treasure." Women Adventure Travelers: Get “Fit for Your Trip”! 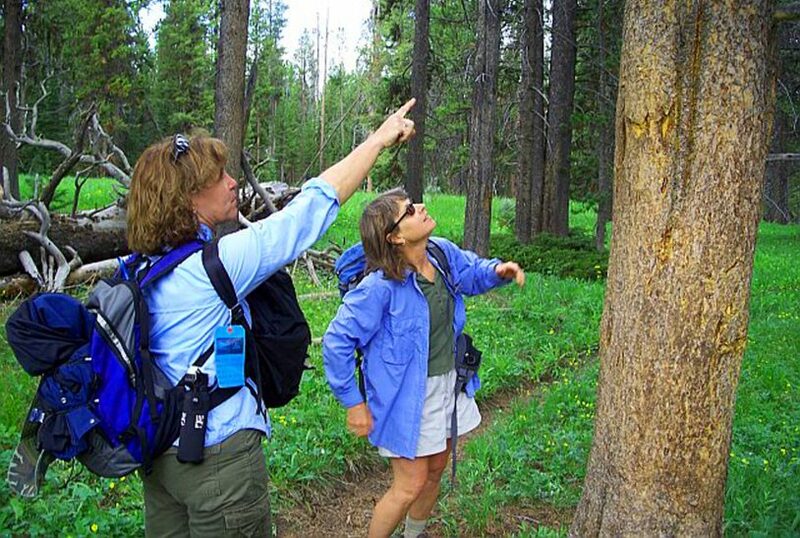 Are you thinking about one of our AdventureWomen hiking, biking or multi-activity adventure trips? Are you not sure if you are physically capable of handling the trip itinerary? Or have you already signed up ... Read more.